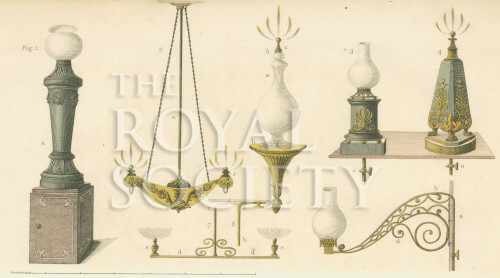 Plate 4 from A practical treatise on gas-light; exhibiting a summary description of the apparatus and machinery best calculated for illuminating streets, houses, and manufactories by Frederick Accum (London, R Ackermann, 1815). The accompanying text states that: “PLATES III. IV AND V. exhibit such designs of different kinds of gas-lamps, chandeliers, lustres, candelabras, &c. as are already in use in this Metropolis”. A footnote in the text indicates that: ‘The gas-lamps exhibited in this plate, are employed in the library, counting-house, warehouse, and offices of Mr. Ackerman, and, by whose permission, they are copied on this occasion’. Friedrich Christian Accum (1769-1838), his name anglicised to Frederick Accum, was a German chemist best-known for his interest in the introduction of gas lighting to London. He was employed briefly at the Royal Institution at the same time as Humphry Davy.